Ever wondered how google maps and other apps are able to tell you exactly where you are on the face of the earth? Or maybe you are past that phase…maybe you’ve already heard of GPS but just don’t know how it works?? Well anyway…this post will tell you how the ‘magic’ called GPS works. If you already know this, don’t worry, there will a lot more interesting post where this came from …. Getting to the point now. The Global Positioning System (GPS) is a network of about 30 satellites orbiting the Earth at an altitude of 20,000 km. These satellites are at such locations that from any point on the earth, at least 4 satellites will always be ‘visible’ (in line of sight). Though 3 are enough to pin-point any location. Each satellite continuously sends out microwave frequency signals to other receivers. Your mobile has a receiver built in. This receiver keeps getting the signals from the satellites. Based on the signal received from the satellites you can find out where you are on the earth, by finding out the relative distances from each satellite. When you read the line above you must have thought…Why do we need 3 satellites?? Isn’t just 1 satellite enough to give us a distance?? Well,….. the answer is no. if there was only 1 satellite, you can be anywhere in a complete sphere around it!! You will unable to pin point a specific location. 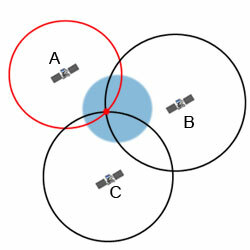 But if there were 3 satellites you could easily pin-point a particular location (take a look at the image below if you still didn’t understand). Now for the tricky part….how do you get the distances? Getting the distance is not as easy as it sounds. Your relative distance from the satellite is measured using the time it takes for the microwave signal transmitted by the satellite to reach you (the time delay actually). This time is calculated using the timezone that you phone is at now and the time that is set at the satellite. According to the General theory of relativity, different bodies under the influence of different gravitational pulls feel the flow of time differently. This boils to, ‘for a body under greater gravitational pull, time will appear to go slower’. Thus the satellite’s clock should go faster that one on the earth’s surface (As gravitational force is strongest on the surface of the earth). But at the same time, the Special Theory of Relativity says that a body moving relative to another body (the satellite moving around the earth in our case) will experience time moving slower than the reference (the earth, that is). Now you might think that the 2 effects will just cancel each other out!!! right? Wrong again. In this case the effect due to general relativity wins and the satellite seems to have time going faster! So this error is calculated and nullified. Check out the video below to understand it better! After all this is done to give you an accurate location of where you are on earth!! Remember this the next time you open google maps to see where you are! And trust those awesome engineers to see to it that you are never lost!